With the FIFA World Cup well under way, we've shortlisted 51 great spots to watch all the footie action live in Dubai. We've also added what deal they are offering you and your mates in celebration of the tournament. Grab some mates and get ready to embrace all the beauty that is FIFA. This rooftop experience comes with an air-conditioned tent, pool parties and a line-up of live enterainment to create a matchday atmosphere. Multiple screens mean you won’t miss any goals and there’s the chance to win tickets to a World Cup match and a holiday of a lifetime. Nice. A whopping 2,000 people of all ages can watch the World Cup matches together. With a gigantic 28 square metre HD display you can choose to immerse yourself among the mega fans at “The Stadium” or opt for a more chilled vibe at “The Bench” which has a gaming corner. You could also win a trip to the Cup’s winning nation and a getaway to the hotel. 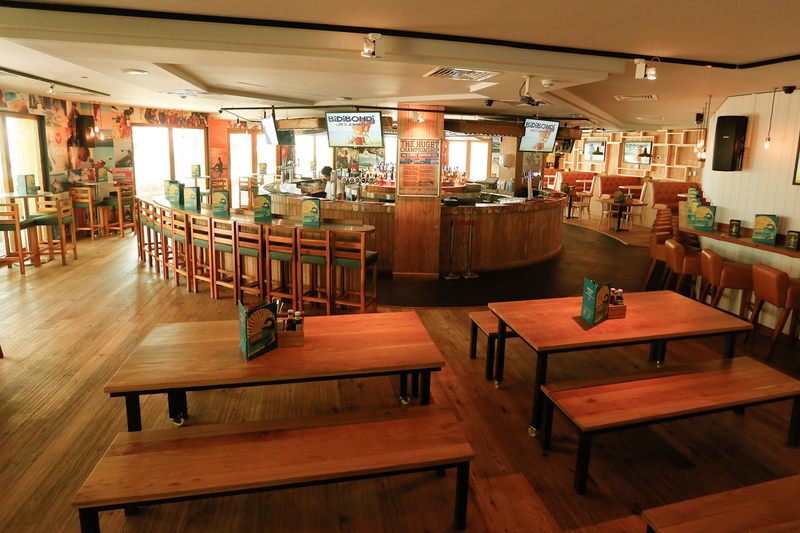 The Aussie bar and restaurant has set up a fully air conditioned fan zone tent in celebration of the FIFA World Cup. Footie fans can catch all the action live on three massive screens and 15 (yes, 15) smaller ones. There’s a neat food and drinks package on offer too. For AED155, you can get your hands on five select drinks or four drinks and a meal from the venue’s à la carte menu. What’s more is for “season” package purchased, you stand a chance to win travel vouchers worth AED10,000. The venue’s pre and post-match games along with its half-time competitions are well worth a try too. 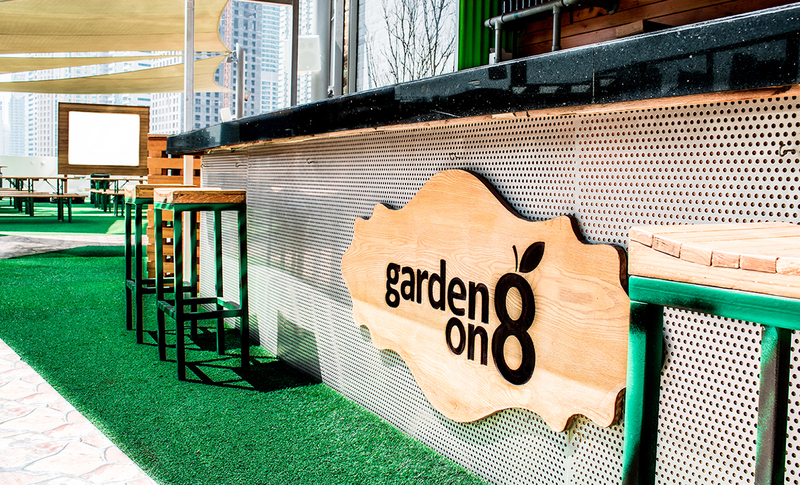 With an air conditioned outdoor fan zone, a specially crafted food menu that includes the likes of Wiener schnitzel strips, tangy BBQ chicken wings and crispy chunky onion rings, and one massive screen airing every single of the FIFA World Cup, Garden on 8 really have gone all in celebration of this year’s World Cup. No really, they have. There’s live entertainment, tons of competitions and face painting too. 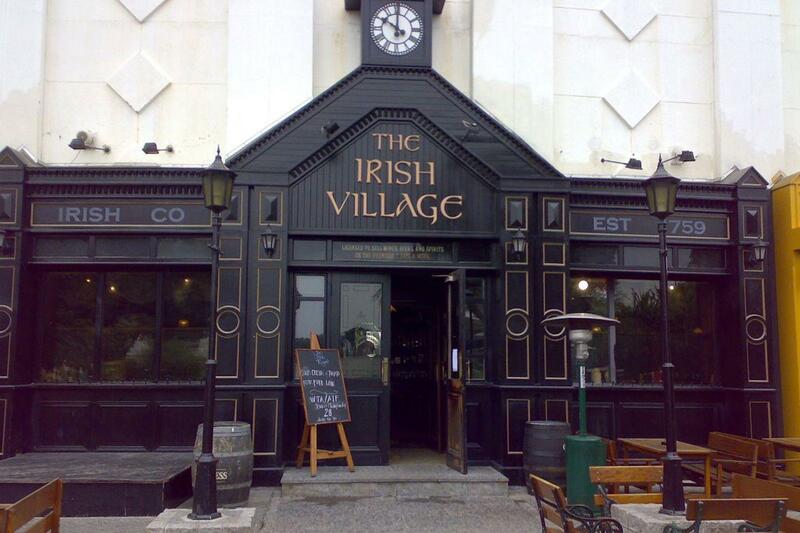 The Irish Village has quite a neat set up in celebration of the FIFA World Cup. Fans can watch their team on the mega screen from tiered terraces while the venue’s lively staff ensure that their every need is catered to. There’s a minimum spend of AED100 – the fish and chips are delicious and well worth a try. Groups of 10 or more are advised to make a booking to secure their seat. With 10 screens airing every second of the footie madness, you sure not to miss a single goal, penalty or “dive” at P&B’s this World Cup. If you’re a foodie, be sure to check out their “Wing Your Way Around The World” offering, that features a selection of dishes from the many countries taking part in this year’s FIFA World Cup. The venue’s daily happy hour and special drink package – a bucket of six bottled hops, will keep you hydrated throughout the tournament. There’s a “Season Ticket” too. For every AED200 spent, guests will receive one stamp. The goal is to get to five stamps to receive an AED100 “milestone” voucher. For those looking for a dedicated area for everything and anything football related, here’s where you need to go. This Ramadan majlis turned FIFA Fanzone can seat up to 320 people. For food, they’re offering cheese nachos, chicken tenders, veggie wraps, BBQ chicken wings and beef sliders. There’s a fan zone for guests to enjoy the venue’s electric vibes along with their teams. Be ready to cheer your nation on and scream at the screen as you dig into the football-inspired food and beverages. Join in the action at this venue’s indoor summer garden, you’ll feel like you’re on the pitch as well. For women, they’ve even got a WAGs corner with special deals throughout the 90-minute matches. It has a new air-conditioned structure, so don’t worry about the sweltering heat. It’s also prepared a menu for the occasion, which includes fan-favourites such as burgers, nachos, flatbreads and many more. Once the night’s matches finish, you can celebrate your team’s victory at their late night parties, from June 17 onwards, with beats from Dubai’s best DJs until 2am. The Barcelona-inspired tapas venue is set to offer all the action across three large screens. Klaus, the goldfish will be on hand (fin?) to help predict the weekly match results for a bit of theatre and fun. Be sure to check out Toro’s social pages for predications and offers. Forget the elephant, it’s football action in the room of this venue. The artisan gastropub has the perfect setting for all fans to cheer together and enjoy the football frenzy that comes accompanied with EE’s classic dishes. Come and cheer at this venue’s air-conditioned terrace. Grab ten of your friends and get your selected hops tower on the house. Other food and beverage promotions include a special World Cup platter and discounted beverages during match games with tons more, too. Watch the matches on the big screen as the venue offers sweet deals on food and beverages in the spirit of the World Cup, but especially for Belgium games. With a massive kick-off party to begin the fun, enjoy two whole kegs, split between guests, on the house. There are special offers for every Belgian game and goal, too. Hunker down for great offers on food and beverages during the World Cup season. From smothered Belgian fries to black Angus beef burgers and mini hotdogs, it’s preparing the perfect football menu for games. This chic venue offers an indoor and outdoor setting with views of the Arabian Gulf to relax and enjoy the game with family. There’s also a brand new themed food and beverage menu that includes hop battered onion rings, ciabatta pizzas and freak shakes. Check out the driving range and Marina skyline as you anxiously watch your team perform. With live screenings from Russia, a special World Cup menu and pre and post-game happy hours, Links is definitely a great place to be over the tournament. Infused with football fever, the South African haunt will be a haven for fans. With the memorabilia adorned walls and delicious food to complement the matches, you’re likely to catch the World Cup fever if you haven’t already. Get away from the scorching heat and hide out at this air-conditioned outdoor setting. Don’t miss a moment on the large LED TV screens and enjoy its World Cup menu. The venue’s adjacent Boulevard Lounge has a fun zone with foosball, face painting and a PlayStation console available. From Mexican chicken fajitas to savoury French crepes and Aussie beef burgers, rally behind your chosen team with more than just the typical football snacks. Watch the game indoors or at the pool with a nacho platter delivered in different styles including Russian, Argentinian and Brazilian. They’ve pitched an air-conditioned tent for fans from all over the world who are eager to support their team. Expect a special food and beverage menu for the matches and indulge in some popcorn shrimp and beef sliders with special offers on drinks served by waiters dressed as referees. Listen up, there’s a new sports bar in town, called The Trophy Room. For some World Cup football action, catch the match on one of eleven screens, in the language of your choice. Try out the “Go for Gold” package for some golden chicken nuggets and golden fries, including a golden beverage. the place also has public transport access. This family-friendly tent on the beach is opening its doors just in time for the World Cup. Catch the games on one of the 15 screens at this air-conditioned tent and enjoy great menu offers, too. 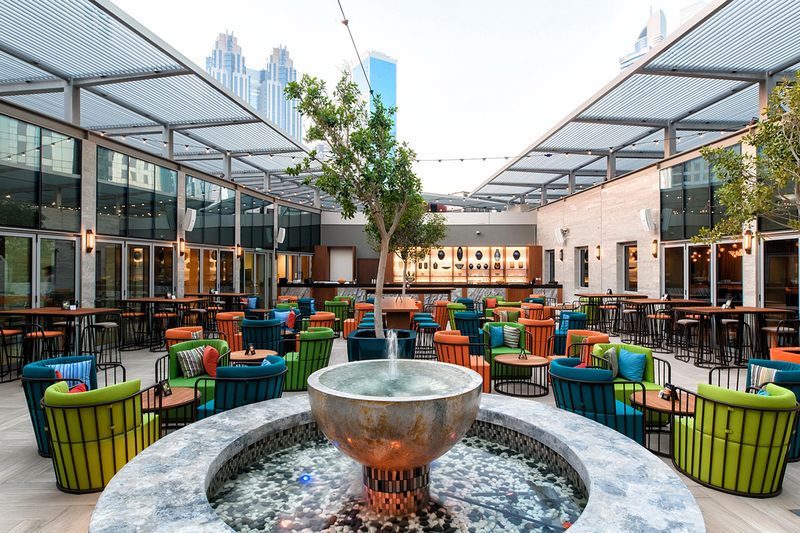 You can catch the matches at any of their locations but for a special brunch, JLT and the Souk Madinat are hosting an afternoon of international dishes from all over the globe with some World Cup tunes. Dress in your team colours for a chance to win some great prizes, too. Celebrating England in the World Cup, Reform has a Local Fanzone in its air-conditioned tent. Happy hour prices are available during games on the big screen, there’ll also be challenges and prizes to be won. Great stuff. There will be a whole host of offers going on at the gastropub over the duration of the World Cup. You can enjoy free face painting, quizzes and more. Drinks are paired according to the countries playing on the day. And brilliantly, if a player scores a hat-trick, Tap House will give all guests a round of drinks. Come on, Harry Kane – don’t let us down. Take your pick between the indoor bar and lounge 261, the outdoor air conditioned terrace and The Big Easy’s Overlook Lounge. All three are screening the matches live with tons of promotions on food, beverages and buckets of hop. The New York themed restaurant is offering free drinks for fans of each night’s winning team so be sure to make sure you’re there supporting your country. While you won’t be able to watch the matches, you can join in on the dance floor celebrations once the scores are announced. There’s a World Cup package for fans down at its DIFC branch. Watch the matches on a 3x3 metre wide screen and enjoy the new package which includes Panko Popcorn, a mini burger, a Hot Mama mini burger, a mini shrimp roll, truffle fries and two bottles of hop. There are four different zones in the popular urban venue to catch the game. There’s a marquee, bar area, semi-private booths and a dining spot to take in all the action. Take part in a number of skill challenges to bag a complimentary bucket of hops. Check out the football fan zone for live action on the big screen and a sports inspired menu with plenty of deals on house beverages. Offers include buy-one-get-one for 30 minutes after the match and the chance to have your jacket dry cleaned. Wait, what? The popular venues are serving up special deals throughout the tournament on drinks and food Buy-four-and-get-two free bottles of selected hops for the matches. 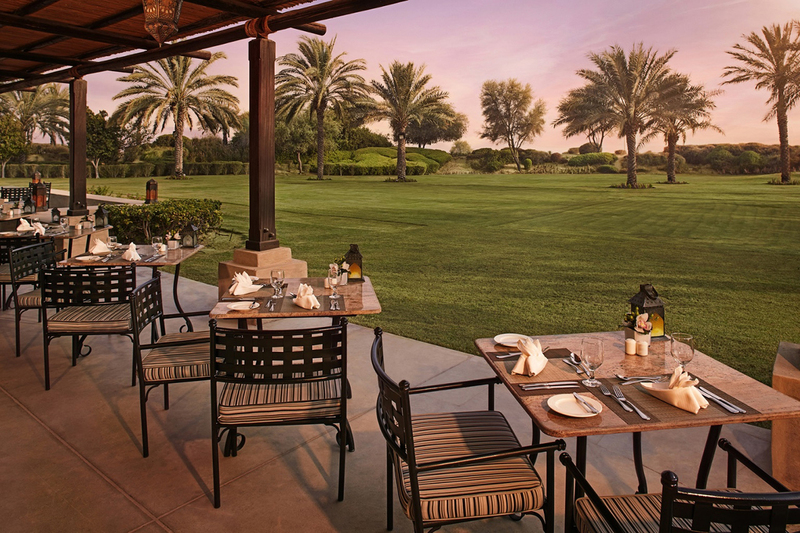 At the JBR branch you can also head over to the secret garden for great offers on food. With the extension, the new fanzone Brothaus is a cool, indoor space that will be serving German beverages and bites with happy hour prices. If you’re not quite hooked, there’s also a huge prize on offer where you could win a week-long vacation at the Steigenberger Grandhotel Petersburg, Germany. For a completely different experience, check out these two fan zones for all the World Cup action. With a 12m wide screen, other large screens, live DJs and room for 8,000 fans. This fan zone will feature eight screens and a giant projector for all the goals. Wear your team’s jersey and you could even get a discount on your entire bill. Also, if you guess the score, you could walk away with some big prizes. 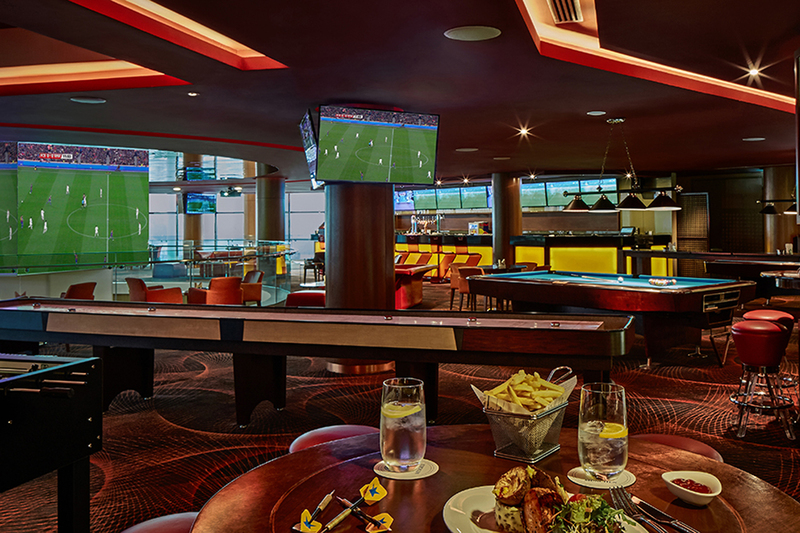 From a nightclub to a World Cup spot, this JBR club offers an electric atmosphere for footie fans during the breaks. There’ll be tunes from international and local DJs, dance shows and great deals available. You could be walking away with some big prizes. Say hello to the bar’s brand new screens for panoramic views of all the matches. Also, look out for some of their competitions to win free burgers, hops and weekend stays at the hotel. The city's day to night beach club is ready to offer all the world cup action on a 16-foot screen with free entry at all times, which is brilliant. You can also enjoy unlimited food and beverages from 15 minutes before the big matches till the final whistle is blown. Expect to see original stadium snacks from pies to burgers and hot dogs. With live DJs and an electric atmosphere, you'll feel like you're at the matches in Russia. Aside from airing every second of the tournament, the lively American sports bar is offering guests 50 percent off its specially prepared Football Madness menu. There’s a billiards table too, for all those who’d like to stick around or kill time in between matches. Bridgewater Tavern have gone all out in celebration of the FIFA World Cup. 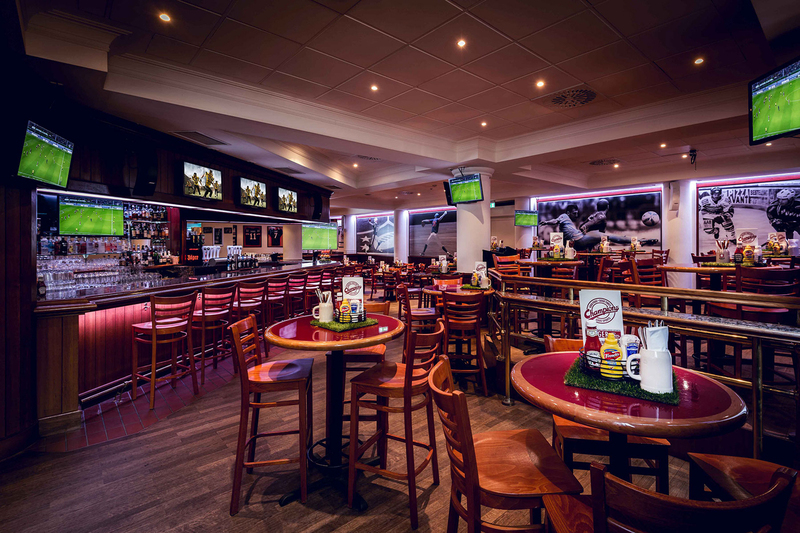 The upbeat sports pub has set up three sections for the tournament – general, private viewing and a special fan zone, which promise to leave you front and center of all the action. Keeping you fueled while you watch as favourites like Neymar, Messi and Ronaldo battle it out on the field, is the venue’s moreish food menu and bucket deals. Score. 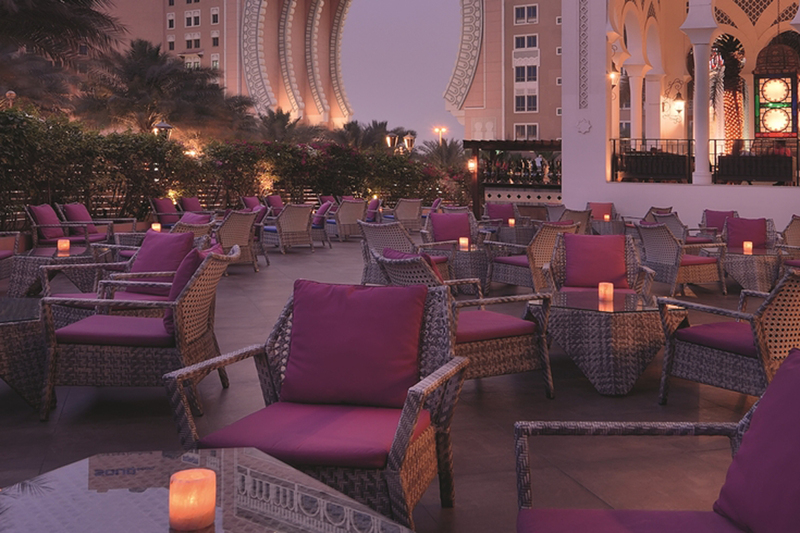 Catch all the action at Moroc’s newly renovated bar or bare the heat and opt for a seat at the venue’s outdoor terrace – the views of the gate are quite impressive. Besides great views and excellent service, the venue is offering guests a daily half time happy hour and a special World Cup food menu. Daily prizes are on the cards too. Footie fans will be treated to live entertainment, free valet parking and a selection of finger food at this buzzing beachside venue located in DoubleTree by Hilton JBR. There’s an outdoor garden – don’t worry it’s cooled, a shisha corner and an after party. If you’re a fan of football and travel, yes travel make your way down to Fogo de Chão. The Brazilian steakhouse is offering every guest the chance to win a travel voucher worth AED5,000 for every game you watch. Sweet. There’s also a special food and drinks offer to savour too. For AED238, you can fest on a Brazilian platter and five hops. If hops aren’t your thing, you can change it for traditional mixed blends. Taking place in the Jumeirah Mina A’Salam ballroom, guests can expect to watch the biggest sports tournament of the year with a fare that is just as impressive. The Hide, Zheng He’s, Khaymat Al Bahar and Tortuga will be setting up mini stations across the area that has been fitted with massive screens to ensure that you don’t miss a single goal, penalty or dive. Some of the food items on offer include The Hide’s moreish grilled beef hotdogs, Tortuga’s chicken quesadillas and Zheng He’s Peking duck slider. If you’d rather steer clear of bars and pool venues, head down to Bab Al Shams where Al Forsan will be putting on quite a show. Aside from airing the tournament, you can expect to find a number of delicious bites, live entertainment and stand the chance to win some great prizes with the venue’s scratch and win coupons. The sports bar is celebrating the World Cup by honouring the tournament’s host nation, Russia. Guests will be treated to dishes like cabbage salad, cluding salmon fingers and a number of traditional drinks. There’s foosball to help kill time in between games and free Wi-Fi for those looking to share their experience with their mates. We’d be lying if we said that we weren’t impressed with RMC’s World Cup offering. Guests receive 20 percent off the venue’s newly crafted menu, a chance to win dining vouchers (anything for AED50 to AED200) is up for grabs and a chance to win an original jersey signed by Cristiano Ronaldo himself. 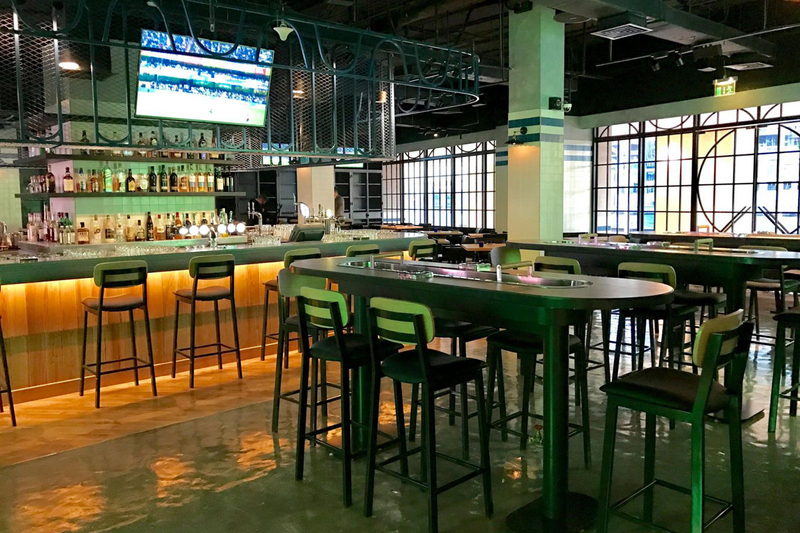 Footie fans will be treated to daily food and drinks offers – AED150 for six bottles of brew and a glorious seven hour long happy hour (12pm-7pm) that sees select beverages slashed to half price. There’ll be plenty to eat – nachos, hotdogs and more as well as not one but four large screens and 10 TV screens – talk about extensive coverage. If you’re looking to watch the tournament with family, The Last Stand should be your go to spot. Located in The Dome in Sports City, the pop up park features three massive screens and has been divided into two areas – The Family Zone and the Main Zone. As its name suggests the family zone is open to all those under the age of 21 and boasts a number of fun activities like foosball, human foosball and giant jenga – nice. The licensed main zone and is only accessible to those over the age of 21 and will see a string of DJs and live bands provide the tunes.